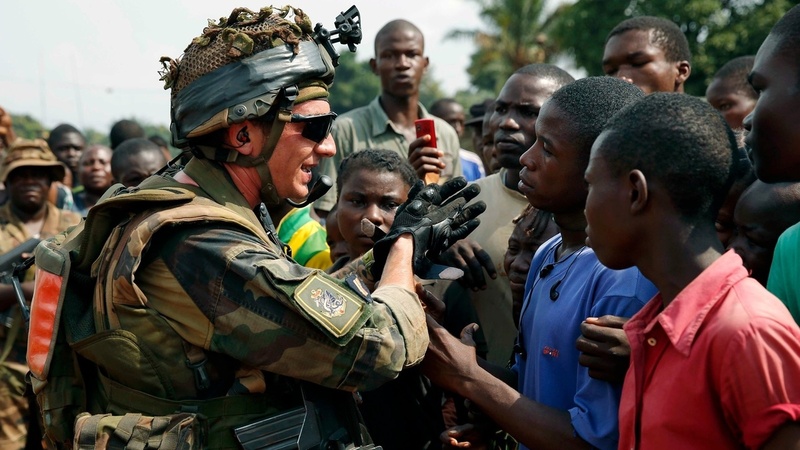 Why French Troops Are Intervening In Africa — Again For the third time in recent years, France has sent troops into a former African colony, the Central African Republic. The French public generally supports these missions, mainly because they are not to prop up dictators, as they have been in the past. A French soldier talks to a crowd outside a church in Bangui, capital of the Central African Republic, on Thursday. Once again, French television screens are full of images of joyous Africans welcoming French troops. In January, the French military intervened in Mali to help liberate large swaths of the country from radical jihadists. Now, for the second time this year, France has sent troops into an African country to quell violence. Last week, French soldiers went into the Central African Republic to stop sectarian killings. In news reports from the Central African Republic, crowds yell, "Vive la France!" as they run out to greet convoys of French soldiers. France also intervened in Ivory Coast in 2011, to back a democratically elected president. The actions have prompted some to wonder if the country is slipping back into its old role of gendarme of Africa. Harold Hyman, foreign policy analyst with the French channel BFM TV, says it's a different era now. "A generation ago, France would support dictators," Hyman says. "Today, the situation's different. If France does not go into a country that's in destruction and mayhem, there are demonstrations in the street from the diaspora of those countries — 'Why aren't you helping us?' So we've settled into this acceptance of a sort of big-brother role." As France suffered its first casualties in the Central African Republic this week, President Francois Hollande visited the capital, Bangui. French President Francois Hollande talks to French troops in the Central African Republic on Tuesday. After bowing before the soldiers' coffins, Hollande told the troops their mission to reconcile a people who have destroyed each other was difficult and noble. He also said that if France hadn't gone into the Central African Republic, no one would have. 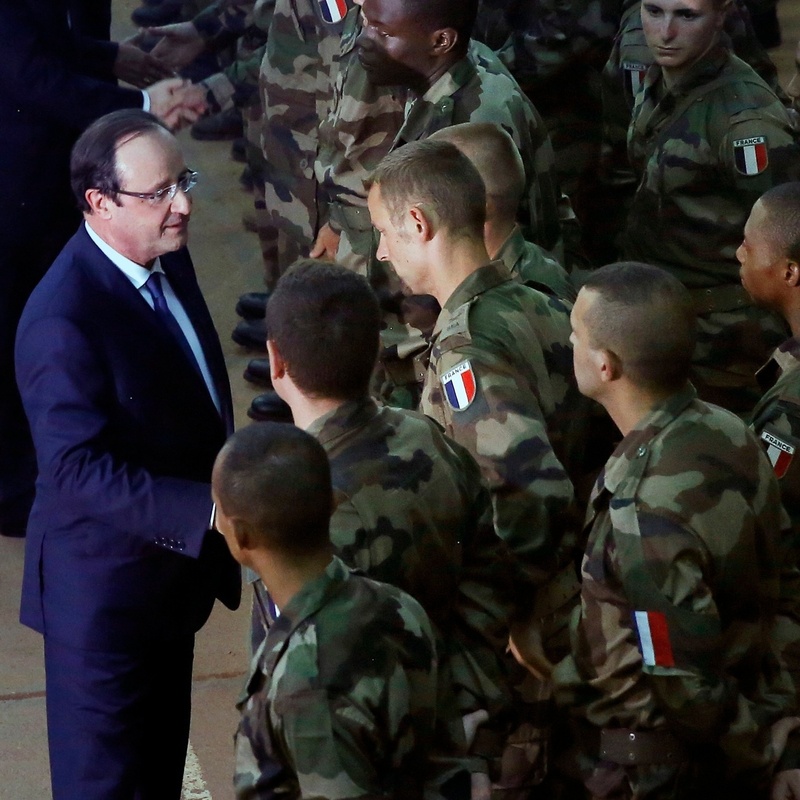 Hollande has asked the European Union to help fund the mission. Roland Marchal, a sub-Saharan Africa specialist, says France has no commercial interests in such a poor country. But together with Chad, it does have soldiers in a joint African Union peacekeeping mission in Mali, and at six other bases in the region. Marchal says France had no choice but to intervene in the Central African Republic, known as CAR. "To leave CAR wouldn't have been possible, because that would have been a major humiliation for Chad, which is one of our best allies in Mali, and as well would have put us at loggerheads with the African Union and the region," Marchal says. A French news report from CAR shows Christian militia members ripping up Qurans. "We want to cleanse this country of all Muslims," they say. Christian and Muslim militias have killed hundreds of civilians in recent days, drawing warnings the country could slide into genocide. Marchal says the memory of Rwanda, where 1 million Tutsis were killed while French soldiers stood by, is another reason France chose to intervene in the Central African Republic. "Our politicians, they don't want to repeat the debate that happened after Rwanda in France," he says. "For the French, it was a very, very significant crisis inside the military apparatus, as well as inside the political class." French presidents on the right and left have sent troops into Africa recently – and their ratings don't seem to suffer. Marchal says France seeks UN backing for its missions, which gives international legitimacy and a measure of cover if things do turn out badly. And the French public is generally supportive, Hyman says. "The French public is accustomed to African operations," he says. "Places like Bangui, Bamako, Dakar; they're totally aware of these places, and a large proportion of people have been to at least one of them. So this is a big difference between France and the United States." On the streets of Paris, France's intervention in Central African Republic resonates with people like Bruno Humbert. "If it's about economic interests, I'm against going in," he says. "But if it's to bring peace and limit the risks of terrorism, I'm all for it."